Anderson & Vreeland and Screen USA have formed a joint-venture distribution agreement combining the expertise and resources of both companies to distribute the Screen Truepress L350 UV inkjet press. The agreement is an expansion of an existing agreement between the companies for distribution of Screen FX CTP devices for labels, flexible packages, folding cartons and corrugated substrates. The Truepress Jet L350 UV press lets Anderson & Vreeland provide converters with a high-speed UV inkjet press that is built with their needs in mind. We are very impressed with the Screen UV inks. Designed for narrow web ultra-violet inkjet printing, the Screen Truepress L350 UV is a production press designed for narrow-web label and packaging printers seeking a cost-effective, high-quality Labels on a variety of substrates. The L350 press targets shorter runs due to SKU proliferation and the need to provide low volume label printing with fast turnarounds. “The Truepress Jet L350 UV press lets Anderson & Vreeland provide converters with a high-speed UV inkjet press that is built with their needs in mind. We are very impressed with the Screen UV inks, particularly how the L350 manages “single pass” white and spot colors. Having the option to corona treat stocks expands the variety of papers and films is a huge plus.” said Jeff Skolnik, Digital Sales Manager for Anderson & Vreeland in the U.S and Canada. Using UV ink, the press delivers excellent print quality on a full range of commonly available label and packaging substrates. It features a 3 picoliter drop size to help ensure smooth gradients and vignettes, life-like flesh tones, a four-level gray scale, provides a solid white in a single shot, and has an expanded color gamut. 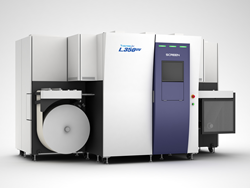 The press can run at up to 164 feet per minute, and aided by automatic head cleaning that purges the print heads in about three minutes, many Screen Truepress L350 UV users are experiencing uptimes of 85–90 percent. Screen USA is the graphic communications industry’s most trusted source for digital imaging solutions. Whether a printer specializes in commercial printing, publishing, packaging or signs and displays, its future is full of promise with Screen. Since 1967, Screen USA has been helping customers in every state in the United States, plus Canada and all of Latin America, achieve higher quality output. We precisely match production needs with the right hardware and software to get the job done. What's more, our comprehensive service portfolio delivers the added boost customers’ business needs for maximum productivity and profitability. Screen, well known for supplying sophisticated PDF- and JDF-based workflow solutions and precision thermal CTP platesetters, continues to introduce exciting new advances in every product category. Ongoing product improvement and software upgrades offer greater value and flexibility. Founded in 1961, Anderson & Vreeland has earned an international reputation as a leading provider of flexo prepress solutions for the graphic arts industry. The company offers a “systems” approach to conducting business by evaluating customer needs and offering the best solutions in the form of equipment, materials, training, and technology tailored for each customer. A&V supports these solutions with over 50 years of experience and a staff of technical sales representatives thoroughly knowledgeable about the fine points of flexography. The company’s substantial flexo experience and technical support sets it apart from other prepress suppliers. This experience and support results in smoother and easier integration of converging technologies affecting flexo prepress. Further information is available on the web at http://www.AndersonVreeland.com.